Observed on the Elgeyo Escarpment, Iten, Kenya, Africa. Dec. 2015. Large land snails lacking shells are known as slugs. Like snails they move along on a layer of mucus secreted by their 'stomach-foot'. This is the reason for the order name 'Gastropoda'. This restricts slug activity to times when the relative humidity is high. 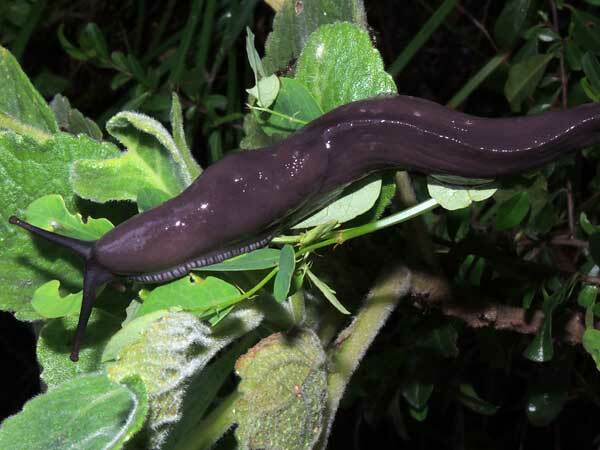 In moist forests slugs and snails can forage by day, but in other environments they must come out of underground hiding only at night or during rain events. This individual was fleeing a raiding column or driver ants (Dorylus).